Sharifi, Mohammad Ali, Farzaneh, Saeed, Sabzehee, Farideh. (1394). The detection of 11th of March 2011 Tohoku's TEC seismo-ionospheric anomalies using the Singular Value Thresholding (SVT) method. 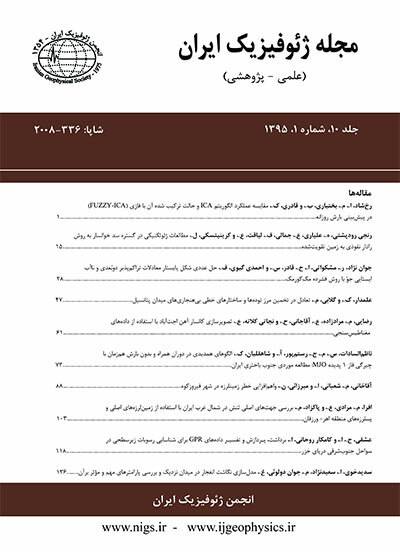 مجله ژئوفیزیک ایران, 9(5), 93-103. Mohammad Ali Sharifi; Saeed Farzaneh; Farideh Sabzehee. "The detection of 11th of March 2011 Tohoku's TEC seismo-ionospheric anomalies using the Singular Value Thresholding (SVT) method". مجله ژئوفیزیک ایران, 9, 5, 1394, 93-103. Sharifi, Mohammad Ali, Farzaneh, Saeed, Sabzehee, Farideh. (1394). 'The detection of 11th of March 2011 Tohoku's TEC seismo-ionospheric anomalies using the Singular Value Thresholding (SVT) method', مجله ژئوفیزیک ایران, 9(5), pp. 93-103. Sharifi, Mohammad Ali, Farzaneh, Saeed, Sabzehee, Farideh. The detection of 11th of March 2011 Tohoku's TEC seismo-ionospheric anomalies using the Singular Value Thresholding (SVT) method. مجله ژئوفیزیک ایران, 1394; 9(5): 93-103. The Total Electron Content (TEC) measured by the Global Positioning System (GPS) is useful for registering the pre-earthquake ionospheric anomalies appearing before a large earthquake. In this paper the TEC value was predicted using the singular value thresholding (SVT) method. Also, the anomaly is detected utilizing this predicted value and the definition of the threshold value, leading to the use of the anomaly as a precursor. The SVT is used in the matrix completion problem, namely the accurate recovery of a matrix from a nearly minimal set of entries. In this study, the SVT has been applied to the ionospheric TEC of the global ionosphere maps(GIM) data on a powerful earthquake in Tohoku on the 11th of March in 2011. In this method, the two-hour TEC observations of this region are converted into a matrix for several consecutive days before and after the occurrence of an earthquake. In this matrix the rows and the columns represent the days and the sequential hours, respectively. The prediction of the non-linear time series is formulated as a method for solving the low-rank recovery problem. Results indicate that under suitable conditions the TEC values can be estimated properly in the aforementioned days and hours by solving a simple optimization problem. In order to show the efficiency of this method in predicting the time series, the results obtained from this research were compared with those from other researches. Akhoondzadeh, M., 2012. Anomalous TEC variations associated with the powerful Tohoku earthquake of 11 March 2011, Nat. Hazards Earth Syst. Sci., 12, 1453–1462, doi:10.5194/nhess-12-1453-2012. Akhoondzadeh, M., 2013. Support vector machines for TEC seismo-ionospheric anomalies detection, Ann. Geophys.,31, 173–186, doi:10.5194/angeo-31-173-2013. Akhoondzadeh, M., 2011. Comparative study of the earthquake precursors obtained from satellite data. PhD thesis, University of Tehran, Surveying and Geomatics Engineering Department, Remote Sensing Division. Cai, J. F., Candes, E. J., Shen, Z., 2010. A singular value thresholding algorithm for matrix completion, SIAM Journal on Optimization, 20 (4), 1956-1982. Candes, E. J., Recht, B., 2009. Exact matrix completion via convex optimization, Foundations of Computational Mathematics, 9(6), 717-772. Candes, E. J., Tao, T., 2009. The power of convex relaxation: Near-optimal matrix completion. IEEE Transduction on Information Theory,56(5):2053–2080. Candes, E. J., Plan, Y., 2009. Matrix completion with noise. Proceedings of the IEEE 98(6), 925-936. Devi, M., Barbara, A.K., Depueva, A., Depuev, V., 2008. Preliminary results of TEC measurements in Guwahati, India, Adv. Space Res., 42, 753-756. Hayakawa, M., Molchanov, O. A., 2002. Seismo- Electromagnetics: Lithosphere-Atmosphere-Ionosphere Coupling, Terra Scientific Publishing Co. Tokyo, pp. 1–477. Liu, J. Y., Chuo, Y. J., Shan, S. J., Tsai, Y. B., Chen, Y. I., Pulinets, S. A., Yu, S. B., 2004. Pre-earthquake ionospheric anomalies registered by continuous GPS TEC measurements, Ann. Geophys., 22, 1585–1593, doi:10.5194/angeo-22-1585-2004. Mayaud, P. N., 1980. Derivation, Meaning and use of geomagnetic indices,Geophy, 22, American Geo. Union, Washington, D.C.
Namgaladze, A. A., Klimenko, M. V., Klimenko, V. V., Zakharenkova, I. E., 2009. Physical mechanism and mathematical modelling of earthquake ionospheric precursors registered in Total Electron Content, Geomagnetism and Aeronomy, 49, 252–262. Pulinets, S. A., Boyarchuk, K. A., 2004. Ionospheric Precursors of Earthquakes, Springer, Berlin, pp. 207-246. Willson, R. C., Hudson, H. S., 1991. The Sun’s luminosity over a complete solar cycle, Nature, 351, 42–48.